I just love to browse through the pages of the Phoenix newspaper on the Library of Congress site. And as usual, I'm not looking for anything in particular, I'm just looking. 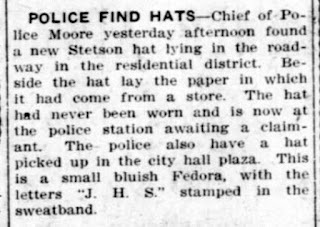 My interest is for the ordinary things of life of old-time Phoenix, and I'm especially tickled by a little article that I found about some hats that were found by the Chief of Police. No, I have no idea really what this was all about, and if the mystery was ever solved. Possibly someday I'll stumble on another article that explains what happened, or maybe you will, but in the meantime I feel my imagination, running away with me. Let's time-travel back to 1910, we're at the police station. I'll be assigned to the case. My name is Friday. I'm a detective. "Friday! ", I heard someone shout to me, "The Chief wants to see you. Something about hats." I knocked and walked into Chief Moore's office. He didn't look up. "Chief? ", I said, "You sent for me?" He moved his cigar from one side of his mouth to the other and said, "Take a look at this. What do you make of it?" "Of course they're hats! I know they're hats! 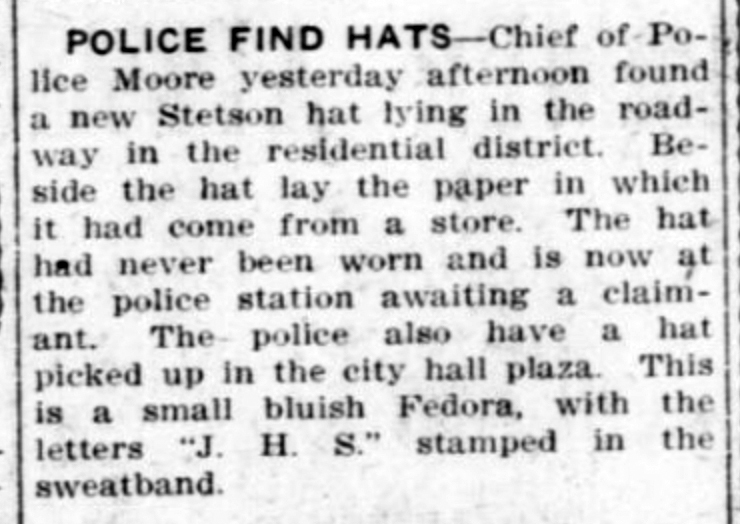 But see here, this hat is still in the paper in which it had come from a store. And this one! See the initials? J.H.S., sounds mighty suspicious to me. I'm putting you on the case." I took the hats, and put on my own, and walked out onto Washington. I looked at the people walking by, and wondered where to start. A lady that saw that I was carrying the two hats ran up to me and started talking very quickly. She was very excited. I took out my notebook and said, "Just the facts, ma'am".